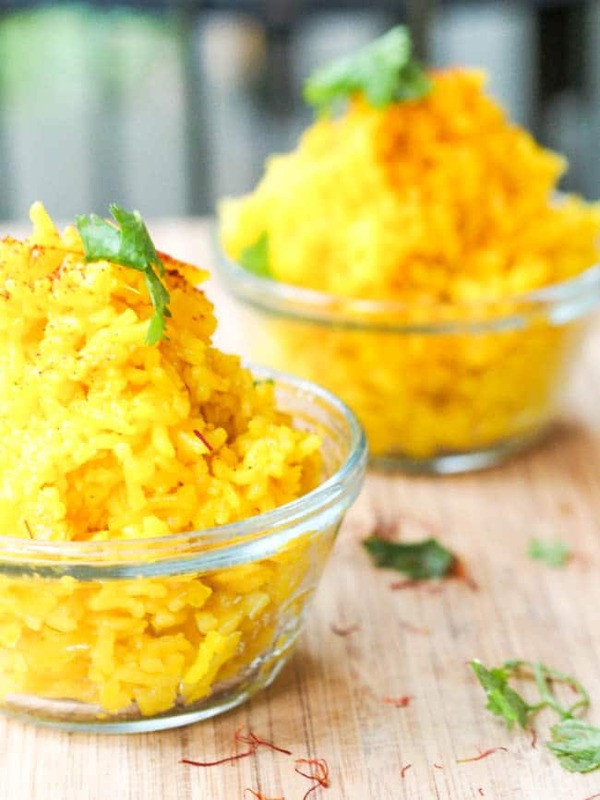 A super simple flavorful, vibrant and fluffy vegan saffron rice pilaf made with onions, turmeric and saffron. Vegan and gluten free. Ready in 30 minutes. Traveling around Nicaragua for the past two weeks has been amazing (as you can see from both my instagram accounts). The people are friendly, the landscapes gorgeous, with lakes, lagoons and coastlines for miles. But it has been hot. As in I can no longer think and am functioning on about 15% levels of energy (both mental and physical). I mean I am clearly not meant to tolerate heat well. Pretty much daily I reach an new all time record high external body temperature it seems. Literally I have never been hotter before in my life. Am I exaggerating? Most likely. But when you’re this hot, you’re not really going to downplay anything. And to top that off, for one reason or another D and I decided to book ourselves into a hostel with a private room that has pretty much zero air flow. There are 2 fans, both a ceiling one and a stand up one and they do not even bring the temperature down a notch. Now yes I do have to admit that for a mere $15 D and I could have purchased the daily rights to the A/C remote and use that in the room. It’s just the principle of it though. If it had already been built into the price then fine, but to allow the room rate to jump up by over 50% (yes the room was $28 a night with the fan) for the A/C remote just seemed wrong. We couldn’t do it. Instead we chose to suffer – backpacker style. For some reason that made more sense at the time. I cannot even begin to explain the thinking behind that. What that’s got to do with rice pilaf you say? Well I really meant to relate the food in Nicaragua to this vegan saffron rice pilaf. We’ve been eating a lotta rice here. Rice for breakfast, rice for lunch, rice for dinner. Sometimes with the beans mixed into the rice, sometimes with the beans on the side. Many times accompanied by a protein and my all time favorite – plantain chips. I have no problems with rice, but a bitta rice variety might be nice. 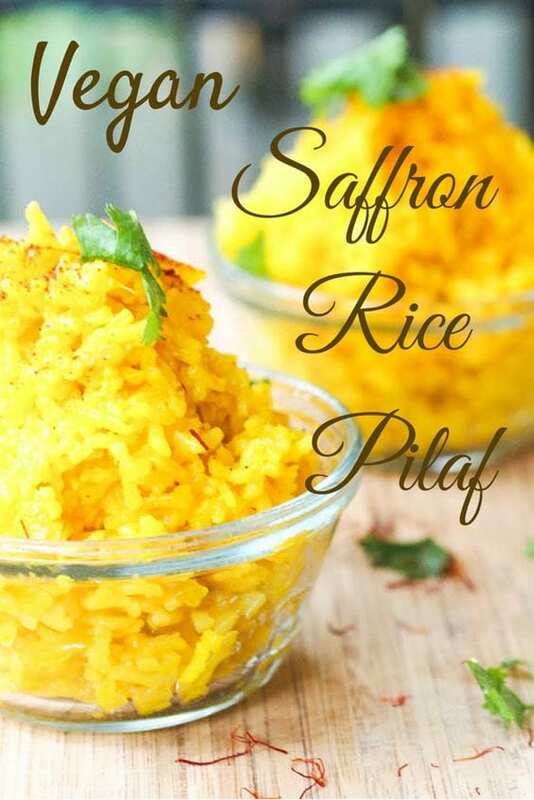 So go forth and make this vegan saffron rice pilaf and send me pics so I can live vicariously through you eating a different style rice dish. This vegan saffron rice pilaf cooks in just 30 minutes and is light, fluffy, fragrant, and vibrant. Just look at that color. 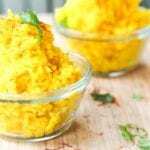 Saffron and turmeric really do color your food brilliantly. Pretty and delicious. A perfect side dish. 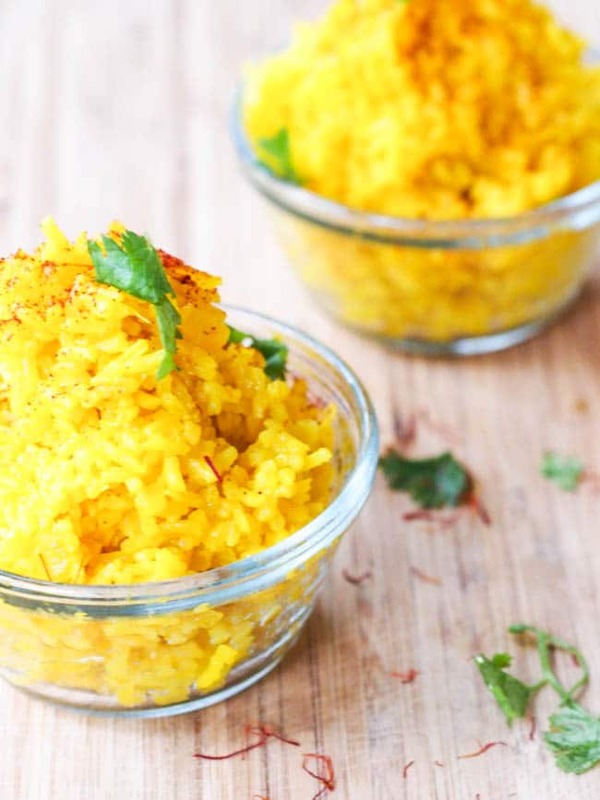 A super simple flavorful, vibrant and fluffy saffron rice pilaf made with onions, turmeric and saffron. Vegan and gluten free. Ready in 30 minutes. Heat oil over medium heat in pot. Add onion and cook for a few minutes. Add turmeric and salt, mix. Add rice and cook for a couple minutes. Add broth and saffron liquid. Bring to a boil. Reduce heat and simmer, covered over low heat for 20 minutes. Remove from heat and let sit for 5 minutes. Fluff with a fork. My mom used to make saffron rice all the time when I was a kid, I should really make some this coming holiday season, it’s so good! And so easy to make! I just love the color that saffron and turmeric give to dishes. So vibrant! Love this..I am surely trying this soon..
this may be a stupid question so i apologize in advance…but you do cook the rice before putting it into the pan..? No, the rice goes into the pan uncooked – so you are toasted the raw uncooked rice before adding in the liquid to cook it. No stupid questions in cooking! Thanks for commenting and asking! I normally add a teaspoon of salt for a 4 person serving. This was easy and really tasty. My husband and I cleaned up half the recipe ourselves served with Zucchini Daal. We will be making this again and again. Wow sounds like a great way to enjoy the health benefits of saffron in a side dish. Thank you so much!